In 2010, the Digital Learning Council ­developed the 10 Elements of High Quality Digital Learning, a framework of state-level policies and actions "designed to advance the meaningful and thoughtful integration of technology into K–12 public education." The elements address everything from student access and advancement to quality content and instruction, assessment and accountability, and delivery. Digital Learning Now's annual report card measures how states are faring in their efforts to align policies on digital learning to the 10 elements. 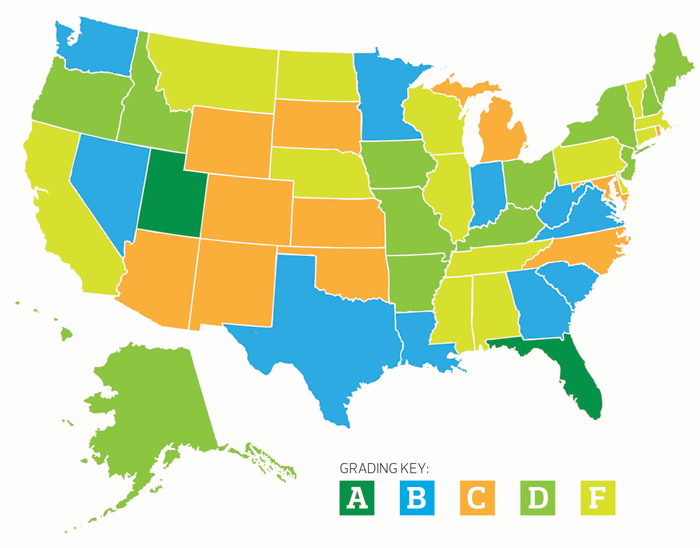 Just two states — Florida and Utah — earned an "A" grade in 2013; 14 were given an "F."
More than 18,000 educators, thought leaders and vendors gathered in Atlanta in late June for the International Society for Technology in Education's annual conference and expo. The EdTech team's reporting of conference highlights — along with videos of attendees offering their thoughts on Common Core preparations, the STEAM movement, emerging technologies and more — can be found at edtechmag.com/k12/iste-2014. For more mobile learning guidance, visit cosn.org/mobilelead and sites.google.com/site/lmlguide/intro.